I came across this apple rasam from Penmai and wanted to try it out right away. 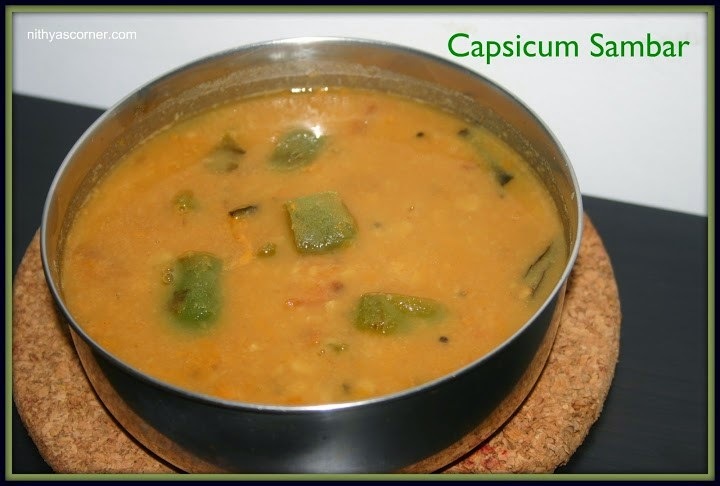 I have tried many varieties of rasam like pepper rasam, paruppu rasam, lemon rasam etc. Apple rasam seems to have a different taste when compared to other traditional rasams. For me, this rasam has a sour taste and very simple and easy to make. Worth trying once! 1. Grind the ingredients given under the Dry Fry & Grind section. 2. Boil the apple pieces using three cups of water. Boil well, but at the same time, apple pieces should not become mushy or very soft. 3. Add tomato pieces, toor dal, ground paste, turmeric powder and salt in an order. Boil well. 4. In a small pan, heat oil. Add mustard and cumin seeds. When cumin seeds sizzle, add curry leaves and coriander leaves. Fry for a minute and then add the seasoning to the apple rasam. Now, the Apple Rasam is ready! 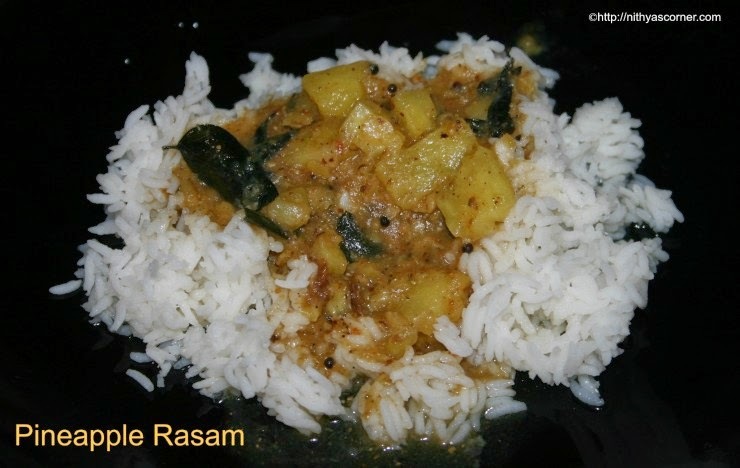 This entry was posted in Rasam and tagged Apple, Apple Rasam on November 22, 2014 by vikashbhardwaz. A very easy and tasty rasam! 1. Pressure cook 1/2 cup of toor dal using 2 cups of water. Meantime, extract tamarind paste by adding 1 cup of water to the tamarind. 2. Keep the tamarind paste aside. Grind Pineapple coarsely to form a puree. Reserve 3 tablespoon of some tiny Pineapple pieces to add it to the final stage of rasam. Filter the puree and keep it aside. 3. In a small pan, heat 1 teaspoon oil. Add coriander seeds, red chillies, peppercorns, Channa dal (kadalai paruppu), Toor dal (thuvaram paruppu), and cumin seeds. Fry until the dals turn golden color. 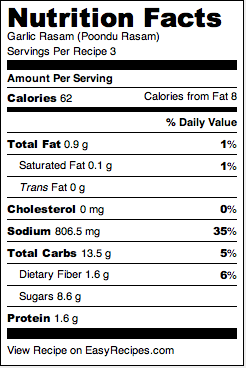 In a mixie/blender, add the fried ingredients along with cumin seeds. Without adding water, grind it to form a coarse powder. 4. In a large pan, heat 2 teaspoons of oil. Add mustard seeds and when it splutters, add curry leaves followed by tamarind paste. Add salt and asafoetida. Boil the tamarind paste well, and then add ground coarse powder. Boil for two more minutes. Now, Pineapple Rasam is ready! This entry was posted in Rasam and tagged Coriander seeds, cumin seeds, pineapple pieces, tamarind paste on November 22, 2014 by vikashbhardwaz. Garlic Cloves (Poondu) – 4 nos. 1. Boil the tamarind paste using 2 cups of water and salt. Add asafoetida. Note. You can also add 3-4 garlic cloves while boiling the tamarind paste. 2. Grind red chillies, pepper powder, and garlic cloves into a fine paste. 3. Add the ground redchilli-pepper powder-garlic paste to the boiling rasam. Once the rasam has boiled enough (has bubbles on the sides of the pan – refer the below picture), stop boiling further more. 4. In a pan, heat 1/4 teaspoon of oil. Add mustard seeds, and let it splutter. Now, add curry leaves and then finally, add this seasoning to the rasam. Now, Poondu Rasam (Garlic Rasam) is ready! This entry was posted in Rasam and tagged Garlic Cloves, pepper powder, tamarind paste on November 22, 2014 by vikashbhardwaz. This entry was posted in Sambar & Rasam on November 20, 2014 by vikashbhardwaz. 1. Wash the greens well and chop it. 2. Boil greens along with green chilli, garlic, and a pinch of salt in slow flame. You need not add water at all. 3. When greens is cooked, mash it finely with a spoon or just grind it coarsely in a blender. Now, the Keerai Masiyal is ready! This entry was posted in Sambar & Rasam and tagged Garlic Cloves, Green Chilli, pinch of salt on November 20, 2014 by vikashbhardwaz.